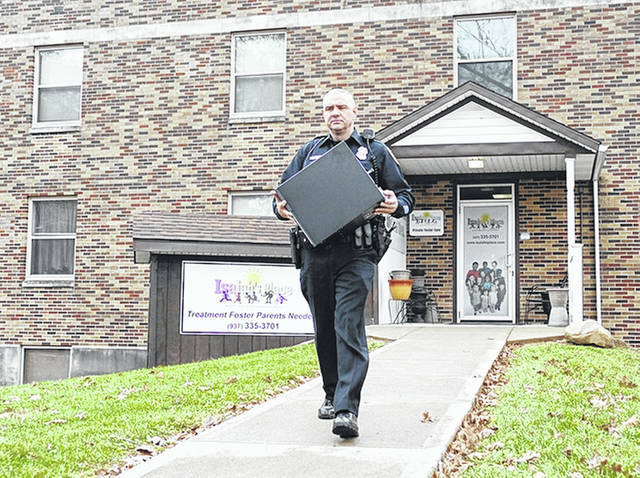 Officers from the Troy Police Department remove items during a search warrant at the office of Isaiah’s Place, a suite inside the Stouder Center, on Nov. 23, 2016, in Troy. MIAMI COUNTY — Two people connected with the alleged theft of hundreds of thousands of dollars from a foster parent agency were arraigned Monday on felony indictments. Siblings Kelley Gunter, 53, and Matthew Gunter, 57, both of Troy, were arraigned on third-degree felony aggravated theft stemming from a search warrant conducted at Isaiah’s Place, a foster parent training organization, by Troy Police Department on Nov. 23, 2016. A third-degree felony aggravated theft is when the value of property or services stolen is more than $150,000 but less than $750,000. According to Miami County Prosecutor Paul Watkins, the amount of money is still being determined, but noted it was well over $150,000. If guilty, they each face a prison sentence of nine to 36 months. Kelley Gunter’s attorney Jeffrey Slyman entered a “mute” plea on his client’s behalf. The court entered a not guilty plea and set a pre-trial date with Judge Stacey Wall on Feb. 4. Matthew Gunter’s attorney Robert Huffman Jr. entered a not guilty plea on his client’s behalf. Both appeared by summons and were granted own recognizance bonds. The delay was due to the extensive forensic accounting search of the agency’s books and computer search by the Ohio BCI, according to Troy Police Department officials. The city of Troy Police Department served a search warrant at the office of Isaiah’s Place on Nov. 23, 2016. The search warrant named Kelley Gunter, executive director of the foster parent and foster care support center, located at 1100 Wayne Ave., Troy, in the former Stouder Hospital building. The warrant seized computer and financial records related to suspected theft or misappropriation of funds. The tip came from a former employee who suspected funds were being misused by the organization. According to the Isaiah’s Place website, the organization provides training for potential foster parents in their own home and opened in 2003. The organization is state-funded with state and county contracts for services relating to foster care. The foster care agency continues to operate with a new board and executive director. https://www.tdn-net.com/wp-content/uploads/sites/21/2019/01/web1_web1_161123aw_Isaiahs_Place.jpgOfficers from the Troy Police Department remove items during a search warrant at the office of Isaiah’s Place, a suite inside the Stouder Center, on Nov. 23, 2016, in Troy.